These brownies are almost raw and very simple to make! Rich, dense and super satisfying! The base of these brownies are inspired by the no bake brownies from minimalist baker. I have less than half of the amount of dates in my recipe due to the very sweet caramel frosting, plus I also don't like my sweets as sweet anymore. 3 simple steps. Blend the no bake brownie ingredients in a food processor. Put some whole walnuts on top. Mix together the caramel ingresients and spread out evenly. Combine all brownie ingredients except the dates in a food processor. Process until finely ground. Add the dates one at a time through the feed tube of the food processor while it is running. (or 2-3 at the time if you don't have a feed tube) You should end up with mix that appears like cake crumbs, but that when pressed, will easily stick together (if the mixture does not hold together well, add more dates). It may seem dry at first, but don’t add any water!! Press The brownie mixture into a lined cake pan or mold. Add some whole walnuts on top of the brownie. Use a small bowl to whisk together the ingredients for the caramel. Spred on top of the brownie evenly. Put in fridge or freezer until ready to serve. These brownies has it all! The right amount of gooeyness from the caramel, density, wonderful texture from the whole walnuts. Lots of deep chocolate flavor and the exact right amount of sweetness! Fluffy, super chocolaty, perfectly sweet pancakes! These are incredibly delicious & the perfect item on any brunch table! Toss all ingredients in a blender, blend until well combined. Over medium heat, pour 1/4 cup of pancake batter on a well-oiled pan. I use unscented coconut oil. When bubbles start to form on the surface of the pancake, flip and cook it for a minute on the other side. Garnish with berries & vegan nutella, Enjoy! Last weekend I feasted on these delicious pancakes! I love making big breakfasts for friends and family during the weekends. These vegan Chocolate Pancakes will make all your breakfast dreams come true! Intensely chocolaty, fluffy and perfectly sweet. This is for all the chocolate freaks out there! If you simply can't have enough of chocolate in all shapes and forms, then you'll love this sweet and salty smoothie with raw chocolate sauce and salted caramel! This smoothie is a real treat! I mean it, it's not the kind of smoothie you start of your regular morning routine with... This is perfect for kids and adults that are really in the mood for something super delicious and decadent but still want to avoid that white sugar! This will definitely do the job if youre having friday night chocolate cravings! Make the chocolate smoothie by blending all ingredients in a high speed blender until really smooth. Make the raw chocolate sauce by blending or simply mixing the syrup with the raw cacao. Assemble the smoothies by dividing the caramel in two medium large glasses. Then pour the chocolate sauce on the inside of the glass. Pour the smoothie in the glass and use a straw or a spoon to create a nice swirl on the inside of the glass. 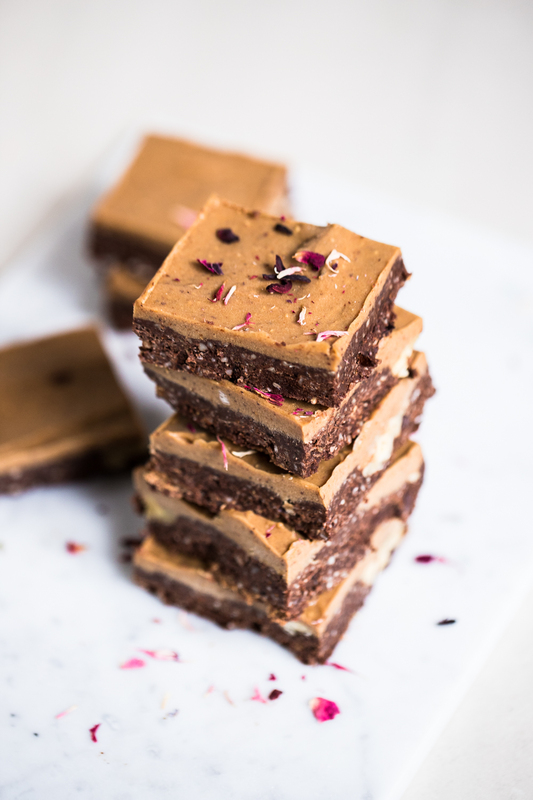 This raw vegan fudge is the quickest fix for your afternoon chocolate cravings! Packed with good fat from almonds and raw cacao. Sweetened with dates and sprinkled with sea salt. Beat the afternoon slump with these decadently delicious chocolate fudges! Snacking is rarely healthy. And let's not kid ourselves, these treats are high in both fruit sugar, fat and calories. Good news though is that they are way better than the regular store bought stuff that you're probably already eating. Another good thing about them is that since they're packed with almonds (peanuts or tahini) they're filled with nutrients and good fat that will leave you full longer. Mix all ingredients (except the sea salt) in a food processor and blend until well combined. Transfer the mixture to a dish lined with baking paper. Sprinkle with a small amount of sea salt and let the fudge sit in the freezer for 10-20 minutes. Gingerbread brownies make the perfect festive treats! Bring the family together and bake this gluten free vegan deliciousness! We spent one rainy afternoon at my place, mixing 3 fabulous natural spa treatments that everybody can make at home. An antioxidant cacao facial mask, a moisturizing avocado hair mask and a rose hip & grape fruit facial cream.